For employers in various fields, security is important. Employees face challenges in addressing risks. The same is true for felons wanting to get a job. In many areas involving security, special clearance may be required. For some occupations this may take the form of a TWIC card. 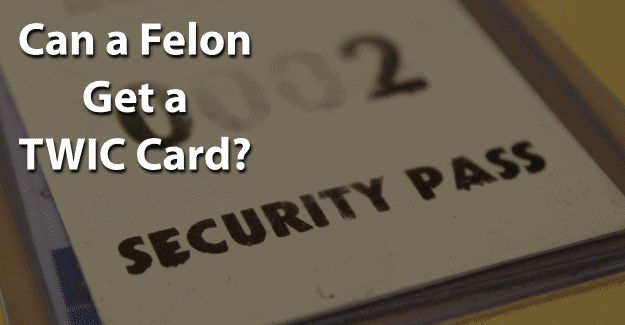 This blog post will cover whether or not a felon can get a TWIC card. In 2009, the Transportation Security Agency (TSA) and the United States Coast Guard started the Transportation Worker Identification Credential (TWIC) program, requiring maritime workers who need unrestricted access to secure areas of port facilities, outer continental-shelf facilities, and vessels to be regulated under the Maritime Transportation Security Act of 2002. There are currently over 3 million logistics and other transportation professionals enrolled in the TWIC program. The TWIC card is fitted with a special microchip containing biometric data about the card holder. It can be scanned either by inserting it into a special reader, or remotely by special sensors. In order to obtain a TWIC identification card, the worker has to go through an application procedure. They are required to provide biographic and biometric information about themselves, such as fingerprints and sometimes retinal scans. There is also a background check conducted by the TSA, and individuals are investigated to determine whether they have a criminal or arrest record, or if they have been convicted of a disqualifying offense. If someone is successful in obtaining a TWIC card, it is valid for five years and then must be renewed. The TSA then conducts security threat assessment background checks for criminal history, immigration status, and terrorism/intelligence watch lists. If a person is disqualified, TSA will send an “Initial Determination of Threat Assessment” with the right to appeal mistakes and seek waiver of certain disqualifications. Conviction for one of the following felonies is a disqualification if the applicant was convicted of, pled guilty to (including ‘no contest’), or was found not guilty by reason of insanity within seven years of the date of the application. A TSA Waiver Review Board reviews every application and makes a recommendation to the Director of Security Threat Evaluation, who decides whether or not to issue the waiver. TSA will send a written decision granting or denying the waiver within 60 days of the applicant’s request for a waiver. The applicant has 30 days from the date of service of the denial to appeal this decision. It is important to be honest in filling out an application when applying for a TWIC card. If a felony isn’t disclosed but is found on a background check, this constitutes as fraud and is punishable. It is a crime to falsify an application, which could result in being sent back to prison. In order to be successful in getting a TWIC card, it is essential for felons to be honest about their background. They are already seen with negative perceptions of being dishonest, untrustworthy, and unwilling or unable to follow directions from authority figures. Having their record expunged can give them the chance needed to begin with a clean record and succeed in getting a TWIC card. Expunging a criminal record allows anyone to honestly state on an application that he or she has not been convicted of a crime. However, not all expungements erase a criminal conviction for TWIC eligibility. Under TSA rules, a conviction is only considered expunged if it is “removed from the individual’s criminal history record, and there are no legal disabilities or restrictions” other than the fact that it can still be used for sentencing for any future convictions. It is a big challenge, but it might be worth it for a felon wanting to get a TWIC card. Having his or her record expunged and also documenting any training programs or additional education could make the essential difference demonstrating good moral character in a felon succeeding in getting a TWIC card. What do you think about this blog post? Have you or someone you know been in the situation of trying to get a TWIC card with a felony? What was that like for him or her, and how did he or she achieve success? Please tell us in the comments below. TO WHOM CONCERNS;YES, HOW MAY U BE? MY NAME IS DONALD L.BURRAGE AND THE REASON FOR THIS MESSAGE IS ME WANTING TO OBTAIN INFORMATION UPON ME GETTING A TWIC CARD.HOW AND WHAT’S THE QUALIFICATIONS.THANK YOU FOR YOUR TIME AND ATTENTION IT’S GRAVELY APPRECIATED.